Actually the formal title was ‘Maximising outcomes with minimum resources for development communications’ – but that is what it means! It was also heartening to hear the results of audience research even in times of economic recession, which showed public support for development – there was a real feeling of pride that their country was in a position to give something back and play a part in the international community. There were 3 presentations from invited experts: an academic, a representative of the private sector, and a social media specialist. Professor Sondra Rubenstein of the University of Haifa gave an interesting introduction which covered how fashions and trends have evolved in communications. She also spoke on the second day about the importance of understanding your audience, and presented 2 interesting case studies from Bangladesh: Meena – a cartoon character who was developed to confront discrimination against girls, and she has become a household name not only in Bangladesh, but also India, Nepal and beyond; and Moni, a symbol of a small child, which has become recognized across Bangladesh, and has helped raise awareness of the need to immunize children. Yossi Koren, VP corporate communications at TEVA pharmaceutical industries gave an energetic presentation of his “what’s next” strategy. He talked about understanding the ‘megatrends’ – what is next in communications. He talked about how to empower special/specific groups of people, and raised the question of identity – how to create prinde in an organisation or issue. He presented an interesting example which was equally valid in the private as public sector, of how organisation, context and client/audience, can be used together with culture, bahaviour and communication activity to come up with specific values that each can agree on. I’ll have to study his presentation to work out more specifically how his examples could be used in a development communications context, but to a UK government communicator, it had a lot of similarities with the GCN Engage approach. Finally Paula Stern gave a whistle stop overview of the opportunities offered by social media – highlighting some of the tools which can help to navigate and cope with what can often seem to newcomers like a tidal wave of information. I spoke about DFID’s digital media strategy with its elements: inform, engage, enthuse and innovate – what we are doing to implements it and how we measure the results. I’m happy to share this with any communicators facing the same challenges. Then, using the example of Haiti, I spoke about how we were able to use all the social media channels we had been building up to communicate our response to the disaster. Being able to react quickly, with unique and powerful content from people actually there was valuable. 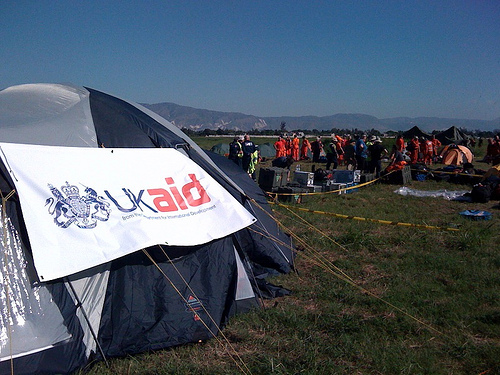 One of the photos sent back by a colleague who accompanied DFID's humanitarian response team. It brought our work to the attention of many new people, however the challenge now is to hold their interest. We need to continue to work on new ways to get people involved in discussion of development issues, in particular targeted communication with people who have expressed interest in a particular subject. My session was followed by a practical workshop, where participants were challenged to come up with a digital communications strategy on one of the following themes: publicising a cause, an organisation, or an event. Despite many of the participants speaking in perhaps their second or third language, and few having any real experience with digital communications, there was lively discussion which ran well over the time allotted. A practical and fun way to bring together all the elements that had been portrayed and discussed over both days. Its the little touches that count!